While it took some people until the already legendary six-minute one shot that ended episode four to get on the True Detective bandwagon, I was more or less on board from day one. I loved what the show focused on right in that first couple of episodes. Some found these episodes slow before things really picked up, but I found them deliberately paced, but enthralling. It’s because the show came back around in its finale to focusing on what I liked about it its first couple of episodes, before I knew to look up the conspiracies and the yellow king and so forth that I liked the ending. 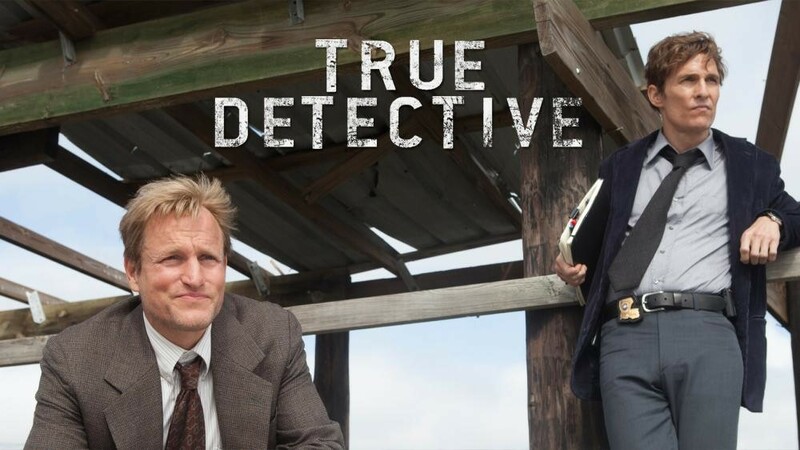 Perhaps the best way to start talking about True Detective is to say that I’ve never seen a murder mystery show where the murder mystery mattered less than in True Detective, and I mean that in a purely positive way. If you’ve read interviews with True Detective creator and writer Nic Pizzolatto, you know that he’s assured viewers throughout that the show isn’t out to fool anyone; he has a healthy distaste for M. Night Shyamalan-style twists and reveals that seem to overshadow the majority of the work and make the viewer feel jerked around. In attempting to keep the show grounded and real, he may have, however, inadvertently jerked viewers around, due to the expectations modern TV viewers have. Pizzolatto’s outlook, which I found refreshing, is the exception rather than the norm, and 21st century TV and movie viewers we’re trained to be obsessive and expect dramatic twists and changes of pace. If you didn’t know better, you might have expected True Detective, with its layers of references to Carcosa and the Yellow King, and religious iconography, to veer if not full out into Lost-like supernatural, then at least to a full-blown cult or deep within a conspiracy that goes all-the-way-to-the-top. None of these were the case, though I don’t think the references and imagery was put in to fool anyway; it was merely part of a rich tapestry of themes and symbols that can exist without having the weight of a much bigger, more epic plot behind it; something that I don’t think would seem so shocking if we didn’t have the weight of expectation that other epic shows have trained us with (take the disastrous ending of The Killing – it wasn’t the potentially somewhat straight forward ending the first season could have led to – it was a much more complicated conspiracy we had to watch a season more and be jerked around with to get to). So if the show fooled you with its obsessions, and if you had different expectations, maybe you felt jerked around by the relatively anticlimactic nature of the conclusion. While I’m sorry that you had that impression, it’s somewhat understandable that you did, and if you did, well disappointment with the ending was equally understandable. Fortunately, though, as I mentioned above, that’s not how I viewed the show. Don’t get me wrong; I loved all the obsessive angles of the show – pondering about the meaning behind Carcosa and the Yellow King, but that’s just an aspect of the greater mood. Dark, eerie, ominous, rural Louisiana in Marty Hart and Rust Cohle’s world was a dark, run down, and dangerous place where the bad often outran the good. What the show was at its heart, though was the story of two partners, of two men. Yes, this show, as director Cary Fukunaga pointed out, doesn’t pass the Bechdel test. Its depiction of women was not particularly complex, and sure that’s a shame. But True Detective only had eight episodes to work with that’s simply not what True Detective was about. Not everything can be about everything. True Detective is about the relationship between Woody Harrelson’s Mary Hart and Matthew McConaughey’s Rust Cohle. They may not be Owen Wilson and Vince Vaughn, but don’t be fooled: This is a bromance. Break through the clutter ,and it’s the story about two men from opposite sides of the tracks. Rust is an intellectual, nihilism-inpsired cop, who believes that the human race is going to hell in a handbasket. There’s no hope for anyone, he surmises. Marty, on the other hand, is a relativist; he plays by his own rules, or tries to, his own rules which dictate that him sleeping around is the best thing for his family, because he needs to takes care of his dark impulses before coming home to hang out in a wholesome fashion with his daughters and wife. These points of view should be diametrically opposed, and they are, but the two men meet cute, find common ground and drift apart, only to come back together again after ten years without speaking. There’s lots more reasons to love the show. The cinematography are direction are top notch and among, if not the best of TV. The one-shot from the end of season four is rightfully renowned, and the beautiful vistas of coastal Louisiana give the show a distinctive sense of place. I can count off memorable shots with ease; the terrifying, jock-strap wearing and gas-masked Reggie LeDoux from far away that ended the third episode, for example, or the baroque and angelically lit shot of Rust Cohle holding up a devil net in the school to end the fifth episode (the show has a lot of memorable episode ending shots). There’s the fantastic choice of palate which contrasts the sharp present day with the blurrier past. But again, that’s not the heart of the show, without which True Detective wouldn’t be what it was. The show ends the way it has to – or at least with the people it has to – Marty, and Rust, together again – and that pairing is why we’re watching. Because in eight hours, we can’t know everything but we do get to know these characters and we grow to love them. They desperately both try to be good men, even Cohle, who claims otherwise. They don’t always succeed, and we certainly don’t have to feel bad for them; that’s the not the point. They’re not asking our sympathy. But they both try to do one good thing for they legacy, something that at least partially compensates for their failures if nothing else and that’s worth celebrating. Marty realizes why he lost his family; he stopped begging, and he’s right that he didn’t deserve them – but he tries – he tries in the only way he knows how. There’s a nobility to their pursuit, and something notable in that it takes the combined efforts of both Cohle and Hart to actually catch their killer. Maybe there’s something cheesy about an ending in which Cohle, relentlessly negative Cohle, actually sees a small sliver of light at the end of the tunnel, but to me that pleasant sentiment is well-earned – even someone as utterly heartless as myself occasionally enjoys a happy ending. True Detective celebrates the ethereal, the philosophical higher plane, but it also celebrates the ground floor, the people and their earth-based, contentious relationships. The cult, the ritual, are what generation forum discussions, and with good reason: they’re a meaningful part of what True Detective is about. But if you just want that, you’re missing the point – this isn’t Lost. There’s no higher level questions that absolutely need to be solved to avoid a let down aside from who did some of the killings we’ve seen; this is eight episodes, not five seasons. Rust Colhle and Marty Hart, two brilliantly developed, written, and acted characters developed over the course of eight episodes, I wouldn’t ask for anything more.